AsPerceived Quarterly has registered with Impress, the independent press regulator in the UK. Contributors to both the AsPerceived website and AsPerceived Quarterly are expected to uphold the Code of Conduct of the National Union of Journalists, the Standards laid out by Impress, the independent media standards organization andthe code for editors. If you feel you have reason to complain about anything that has appeared on the AsPerceived website or in AsPerceived Quarterly (APQ), then please contact the editor and we will try to resolve the matter amicably. Suggestions for improvements will receive serious consideration. We will apologise in writing, on the website or in APQ if necessary. We welcome ‘letters’ for publication which correct or put other material into context. Please send material for publication to letters@ asperceived com. 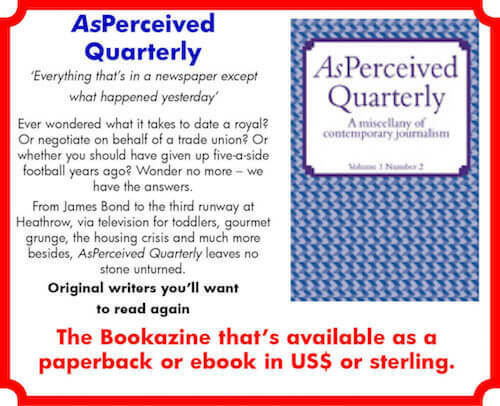 If you wish to raise the matter informally, please e-mail the editor editor@ asperceived.com – or write to The Editor, AsPerceived, PO Box HP346, Leeds LS6 1UL, UK. We will endeavour to acknowledge all messages by e-mail within five working days. However if you wish to register a formal complaint, please e-mail complaints@ asperceived.com or write to Complaints, AsPerceived, PO Box HP346, Leeds LS6 1UL, UK, putting ‘Complaint; Confidential’ in either the subject line or on the envelope. Please state the nature of your complaint as precisely as possible, citing evidence to support the allegation(s). The proprietor(s) of AsPerceived and their agents reserve the right to contact complainants by telephone, e-mail and/or post, using details provided by the complainant. AsPerceived has a small panel of independent complaints panel members, each of whom has experience of the ethics of journalism. Complaints will be assigned randomly for investigation according to availability. Complaints panel members work within agreed confidentiality protocols and within the provisions of UK data protection regulations. Such complaints panel members will not have had contributions published in at least four preceding issues of AsPerceived Quarterly or online within the previous six months. Receipt of complaints should be made within five working days. By lodging a complaint in this way, permission is granted for personal information to be disclosed to the complaints panel member responsible for the investigation. If necessary, complaints panel members will contact complainants directly should further information or clarification be necessary. Complainants citing others as witnesses or sources of evidence should provide confirmation that such individuals have consented to involvement and give permission for their contact details to be disclosed to complaints panel members. Complaints panel members will investigate complaints with AsPerceived editorial staff and/or contributors and provide copies of written assessments to both parties with recommendations for resolution. Wherever possible, this should happen within 15 working days of the receipt of a complaint. The proprietor(s) of AsPerceived accept no responsibility if circumstances such as individuals’ availability prevent this or for any delays attributable to the complainant. Should the suggestions for resolution be unacceptable, a final appeal may be made to a second complaints panel member. If hearings are necessary, complainants accept liability for all their own costs associated with the attendance at such events and for the costs of any witness(es) they wish to call. Wherever practical, to minimise cost, the use of internet or telephone/video conferencing facilities will be considered. Similarly, the complaints panel member will hear evidence and may question all parties both during hearings and, should clarifications be necessary, shortly thereafter. A second written recommendation for resolution will then be sent to both parties.